The Big Year is the movie all birders have been waiting for all their lives. 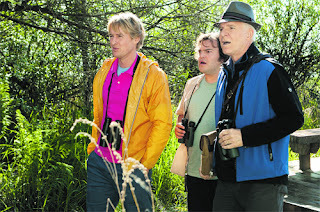 With Jack Black, Steve Martin, and Owen Wilson joining forces, the real birders out there are no longer fringe enviro-nerds but rather have been immortalized to look like comedy superstuds. The funny thing is that this movie is not a comedy. The only line that made me laugh was when a woman non-birder agreed to go on her honeymoon to a remote Alaskan island and gets attacked by birds as she holds her gut-soaked $250 scarf, angrily attempting to clean it outside. Wilson exclaims to his fellow onlooking birders, "Hitchcockian." But the lack of humor is probably what makes this Hallmark-like classic tick. The three stars, attempting to see or hear the most birds in a calendar year in order to be named something called "The Big Year" champ, have heartwarming backstories. The premise seems ludicrous early in the movie, but by the end, it would take a hard cynic to not appreciate the passion they each have for their birding hobby. That said, we must be a nation of hard cynics because The Big Year, despite its mega star power, pulled in a fraction at the box office of its cost to produce. It is by no means a bad movie. It's more like an indie with big stars and big expectations. If it were simply an indie, it would probably have been really highly praised.